This page contains material related to "Division Blocks and the Open-Ended Evolution of Development, Form, and Behavior," a paper in the Proceedings of the Genetic and Evolutionary Computation Conference (GECCO-2007), published by The Association for Computing Machinery. We present a new framework for artificial life involving physically simulated, three-dimensional blocks called Division Blocks. Division Blocks can grow and shrink, divide and form joints, exert forces on joints, and exchange resources. They are controlled by recurrent neural networks that evolve, along with the blocks, by natural selection. Division Blocks are simulated in an environment in which energy is approximately conserved, and in which all energy derives ultimately from a simulated sun via photosynthesis. In this paper we describe our implementation of Division Blocks and some of the ways that it can support experiments on the open-ended evolution of development, form, and behavior. We also present preliminary data from simulations, demonstrating the reliable emergence of cooperative resource transactions. Spector, L., J. Klein, and M. Feinstein. 2007. Division Blocks and the Open-Ended Evolution of Development, Form, and Behavior. In Proceedings of the Genetic and Evolutionary Computation Conference (GECCO-2007), pp. 316-323, New York, NY: The Association for Computing Machinery. Full paper in PDF format: http://hampshire.edu/lspector/pubs/db-gecco-2007.pdf (1.1MB). 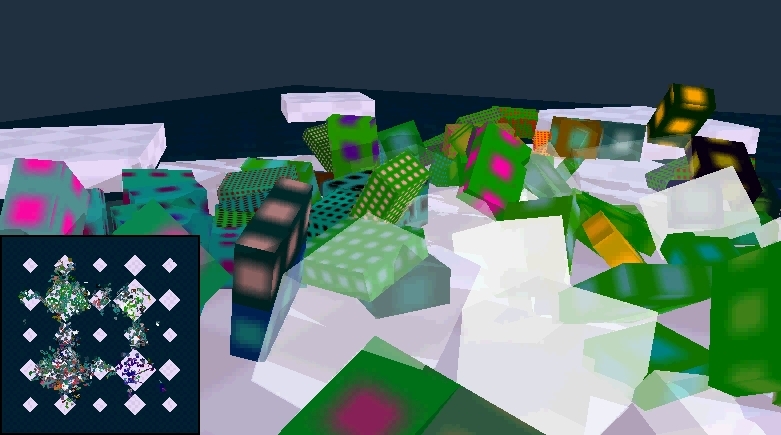 A brief movie of a Division Blocks simulation: http://hampshire.edu/lspector/db-gecco-2007/db-gecco-2007.mov (4.5MB). Prepared for the GECCO 2007 conference (but with movies removed): http://hampshire.edu/lspector/db-gecco-2007/db-gecco-2007-presentation.pdf (2.4MB). Jason Tor, Ray Coppinger, Chris Perry, Kyle Harrington, Andrew Stout, and anonymous reviewers provided suggestions that helped to improve this work. Members of the Hampshire College School of Cognitive Science provided feedback on a preliminary presentation, and Rebecca Neimark edited and improved the draft. This material is based upon work supported by the U.S. National Science Foundation under Grant No. 0308540. Any opinions, findings, and conclusions or recommendations expressed in this publication are those of the authors and do not necessarily reflect the views of the National Science Foundation.